Who’d have guessed it? Gas prices under $3.00. That’s what you pay these days in Red Lodge and Columbus. Great news, right? Maybe not for Energy Corporation of America and other companies that have plans to bring “a little bit of the Bakken” to the Beartooths. The continuation of the shale boom in the United States depends on the price of oil. The costs of getting the oil out of the ground and to the pump — labor, equipment, refineries, shipping — don’t fluctuate much. So if the price of oil goes down, it means revenues decline and getting the oil out of the ground becomes less profitable. Oil prices August – November 2014. Click to enlarge. And make no mistake about it, the price of oil is coming down. 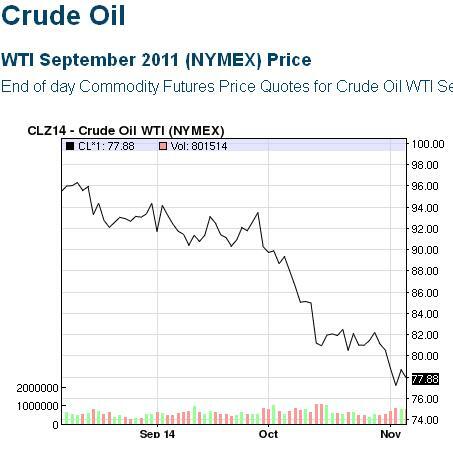 In the last three months the price per barrel has declined from $96 to $77.88 as of November 6. The price has dropped 25% since June is now hovering at right around a three-year low. There are several reasons for this. There’s the increase in North American production, an increase in Libyan production, reduced demand in Europe and Asia, and a recent cut in prices by OPEC, among others. In the short term you can’t worry too much about oil price fluctuations. It’s nice to pay less at the pump, but we’re used to seeing gas prices rise and fall. But what happens if these price levels continue? At $100 a barrel, oil produces about $15 of profit per barrel. Because costs are relatively fixed, at $90 a barrel that profit goes down to $5, and at current prices it is not profitable to pull oil out of the ground. For large stable companies that is not a problem in the short run. But for smaller companies that have taken on substantial debt to drill in shale plays, the drop can be catastrophic. In the longer term a drop in price will mean that production goes down, and it will affect production first in areas where reserves are not as rich as in the Bakken. We don’t know what’s going to happen. But here’s the key point for elected officials and residents along the Beartooth Front. An oil economy is by its very nature a boom and bust ride, and there’s nothing local communities can do to control when it booms and when it busts. We can look at the wealth generated in the Bakken and wish that it comes here, but even if there are substantial oil reserves in Belfry and Roscoe, whether it gets pulled out of the ground will depend on events in Washington and Saudi Arabia and China and Europe and Iran and elsewhere outside our control. And if, as many believe, the reserves here aren’t as rich as in the Bakken, operators will vacate here if the returns don’t match those in North Dakota. Our responsibility in the face of this uncertainty is to maintain the long term viability of the community: to make sure personal property is protected, to require the preservation of our water, and to enable the continuity of a way of life along the Beartooth Front. These are the things that need to be constant no matter what happens to the price of oil. This entry was posted in Fracking Information, Uncategorized and tagged gas prices, oil prices. Bookmark the permalink. Potentially good news–at least for now, but not necessarily great news. We may have been fortuitously provided more time to prepare for the second coming, but the fracking wells will eventually be back to Carbon and Stillwater Counties–whether they remain on schedule now or not.